Dear reader: This is the first in a series of blog posts in which author Marc Steinberg invites us into his own world of anime collectibles, explaining what makes each object interesting and how it has contributed to the history and transformation of Japanese media culture. 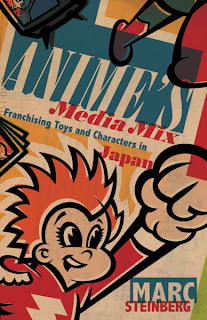 My recently published book, Anime’s Media Mix, is best described as the product of an intersection between a theoretical problem, a historical question, and material artifacts. The theoretical problem was how to build a conceptual understanding of media connectivity in an age of proliferating media and things, and ever-stronger techniques of connecting them together. In Japan this phenomenon of interconnectivity is particularly intense, and goes by the name "media mix." The historical questions were, when did the media mix arise in Japan, and how can we account for the central role that television animation or anime in particular (but also manga and related media) play in it? Finally, the material artifacts. These were material facts, or pieces of living history. Of course each object comes along with a story, a history, a context. But it’s often through finding a particular artifact that I was able to begin to further unravel the story of the media mix. Making sense of the objects was in many ways a point of departure for making sense of the way connectivity was constructed across media forms and platforms. The existence or non-existence of material artifacts was in many ways also the clue to the when-how-why of the media mix in Japan. If I make the argument that the genesis of the media mix in Japan can be traced to 1963 and the beginnings of made-in-Japan television animation with Tetsuwan Atomu (Astro Boy) it’s because this narrative is backed up by the explosive proliferation of material objects related to the show. To be sure there are precursors, but the material archive suggests the importance of this year, and this event. Needless to say, then, this book project involved not only the collection of documents, but also a collection of things. Thanks to the support of the good people of University of Minnesota Press, I had the chance to present some of these things in the form of image reproductions in my book. But there were a good number of things I didn’t reproduce, or couldn’t discuss. So I’ve decided to use the space UMP has provided here to introduce some new objects – collectibles from my closet – that I merely touched on in the book, or perhaps didn’t touch on at all. It’s safe to say that the book project projected me into collection. Allow me to do a little show-and-tell here, over the course of the next few posts – showing some objects, and telling some stories about the process of research that led to Anime’s Media Mix. a packet of Marble Chocolates in 1963. While I already show it and tell it a lot in my book, there’s really no better place to start than this Atomu sticker sheet (at left). This sticker sheet is the genesis of book; the material kernel around which it’s built. What is this sticker? It’s a freebie – in technical terms, a premium – that either came inside a Marble Chocolates pack or could be received in the mail by sending away several proofs of purchase to Meiji. 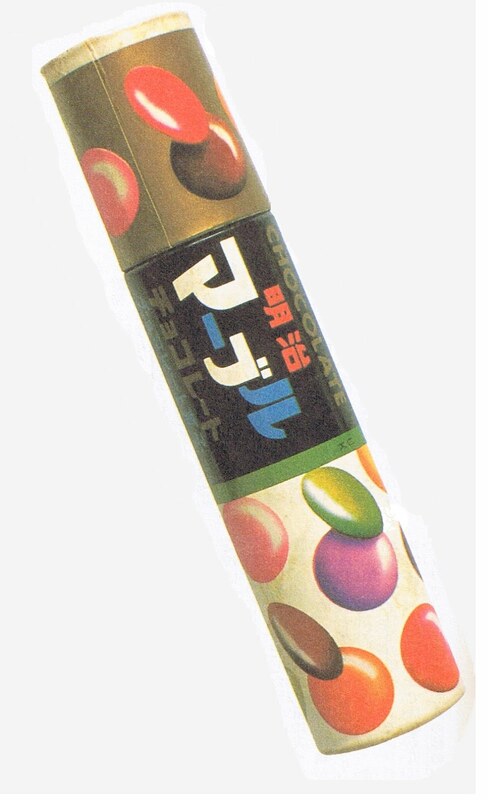 Marble Chocolates are a kind of chocolate candy not unlike Smarties or M&Ms that come in a cylindrical box (below). They were a hit candy around the time of Tetsuwan Atomu came on the air, and they were made by Meiji Seika, the confectionary that was the Atomu TV show’s sole sponsor. the time Astro Boy came on the air. 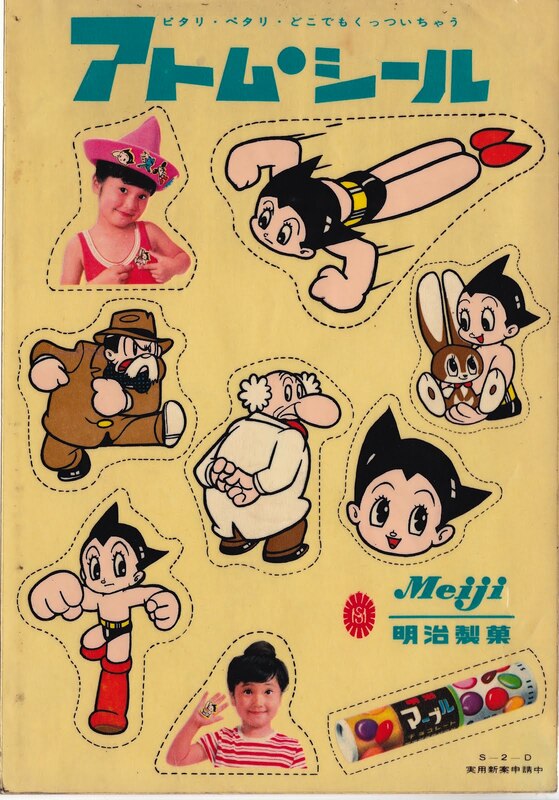 Looking to increase their already considerable market share, the Meiji marketing department decided to include a sticker of Atomu in each pack of Marble Chocolates for a short period in the spring of 1963. After they found it to be a huge success, they started a second campaign whereby children would collect three Marble Chocolates caps and send away for an "Atomu and Friends" sticker sheet that would come by mail. The local post office became inundated with requests, and Meiji realized it was onto something. Atomu became a staple for Meiji for the subsequent years it was on air, and children’s chocolates were quite literally reorganized around made-in-Japan TV animation series. 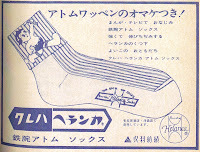 It also ignited the “chocolate wars” of the early 60s, and kick-started TV animation production in Japan, with Meiji’s rivals Morinaga, Glico, and Fujiya rushing to sponsor TV anime shows. What made the stickers so interesting to me is the way they embodied the potential of the character image to be anywhere, anytime. Children could stick them onto objects, take these objects with them to school, to the playground, or wherever, and literally relive (or continue to live) the Atomu world. As such the stickers are a kind of theoretical and conceptual paradigm for character merchandising as such, and character merchandising quickly adopts the potential of the sticker and takes it to its logical conclusion: sell toys, notebooks, shoes, socks, and so on with Atomu images stuck on them already. So simple, yet so much a product of the stickers themselves.